A few weeks ago I attended a small dinner party. The hosts asked what each of the guests wanted to drink, so I requested what I always drink with dinner: A glass of milk (and a glass of juice, but I didn’t want to ask for too much). I replied that of course I drink milk. 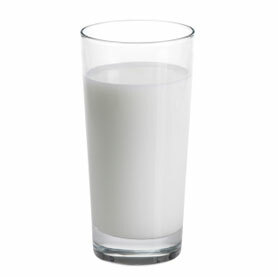 I’ve had a glass of milk with every dinner my entire life. I assumed that’s what most people drink with dinner. But one by one, the other guests confirmed that they never drank milk with dinner. In fact, few of them drink milk at all. They use it for cereal, but that’s it. This is fascinating to me. Milk is such a staple dinner drink that I really had never considered that other people drink different things with dinner. This is what we drank in my family. In college I had a glass of milk in those oversized translucent plastic cups. Even in Japan, where milk is super expensive, I bought and drank milk every night. I’ve always had milk with dinner. How else do you get your calcium and vitamin D? But this changes everything. I need to reframe my entire worldview. So help me out and tell me in the poll below what you drink with dinner. I need to know. This entry was posted on Thursday, March 12th, 2015 at 9:10 pm	and is filed under poll, question of the day. You can follow any responses to this entry through the RSS 2.0 feed. My family even has the tradition of having chocolate milk with our weekly Friday night pizza. People look at us weird when we discuss chocolate milk instead of alcohol or pop with pizza. My wife and I both have had chocolate milk with pizza since high school so it just seems the right thing to do and we passed that on to our kids. I think part of that is growing up here in the midwest. Breakfast is juice to drink and milk on cereal. Lunch is usually water as the beverage to stay hydrated. Then, like you said, milk with dinner (sometimes chocolate). When I go out to eat, I normally just get water. Restaurants charge way to much for a glass of milk these days. Like you were surprised of hearing nobody drank milk, I’m surprised about reading people drink it with the dinner. I’m from Spain and here milk in the dinner it’s a really strange thing. And it’s the first time I’ve ever heard of it. I drink soda (Diet Coke) but people I know usually drink beer, wine or water depending on the type of food you’re having. Valentin: Thanks for sharing! So do you eat other dairy products (like cheese) with lunch or dinner? Yes Jamey. I love cheese, and the way I usually have it is precisely at dinner. Here in Spain the ‘tapas’ thing is like a culture for us and I usually do it sometimes when I get home I don’t have a proper dinner cooked. I pour myself a beer, I cut some slices of cured cheese, I take some olives and I’m happy. Those things for instance are the typical things you can offer here to your guest when they’re at your home. Those and some ‘jamón serrano’ (Spanish ham, or cured ham, I don’t know if you know it) and you will be the perfect host. Very nice! Yes, I know tapas well–we have some great tapas restaurants in St. Louis. I had milk with probably 50% of dinners growing up, but as an adult with weight issues, I had to reconsider. We are the only species that routinely drinks milk past weaning, and also the only species that routinely drinks milk from another species. It’s not really that good for us. The protein and calcium are not that bioavailable. (Now I do totally la la la on this for CHEESE). So mostly now I drink water or soda. I drink iced water (it’s iced or nothing!) with all my meals. My wife doesn’t drink anything with her meals. I drank milk quite often with dinner growing up but seemed to get away from that in high school or college. I will occasionally have milk depending on the meal. Thinking about it now, it’s usually when I decide to have either “breakfast for dinner” or a “kiddie meal” like macaroni and cheese or peanut butter and jelly. Those things just necessitate milk as your beverage! Otherwise I have water. I find that I get busy and don’t drink enough water during the day, so I really need it once I get home. Hahaha, no it’s not that. I think I drink milk when I’m eating comfort foods, which do tend to be a lot of foods from my childhood, coincidentally! Apparently I know nothing about what I put in my body. 🙂 Is that really true? Whole milk is better than skim milk? And skim milk is only slightly better than Coke? Coke is terrible for you! 🙂 I’ll dig deeper into this. I picked water because I’m not sure you’ve included what we normally drink. We drink squash – fruit flavoured water. You may include that under juice, but I think of juice as being actual undiluted fruit juice. We also drink tea and wine/beer depending on the meal and time of day. Renate: Hmm, good point. I would probably put that under water. Very interesting flavor! I chose ‘water’ as I drink that most often. But usually, I’d drink nothing at all with dinner. Sometimes I drink and sometimes I eat. Sometimes I do both, but – thinking about it – this is usually at restaurants. I do enjoy drinking milk, but would do so as a ‘snack’. I enjoy both forms of consumption, so I prefer to spread my pleasure around the day. Behrooz: It’s very interesting that you usually don’t drink anything with dinner. You don’t get thirsty? Generally, no. I do drink throughout the day, so maybe folk who drink with meals don’t have the luxury of a bottle (of water) by their desk? I drink water with my meals. To me, water is a palate cleanser so I can really taste and savor my meals. Kris: It might be a midwest thing, though I grew up in Virginia. 🙂 It seems that water is the popular choice for refined palates! Okay, so I’m like the lone soldier on drinking nothing with my dinner most of the time. If I eat out which includes at a friend’s or a restaurant, I’ll go for some kind of hot/cold drink, alcohol, and/or water depending on what we are eating for dinner. And I don’t feel thirsty, except when I have pizza. I would like to have a little bit of soda when I have pizza.